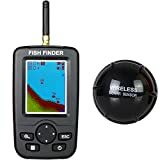 The Venterior Portable Fish Finder Wireless Sonar Sensor Depth Color LCD Display seems to be an excellent product with several wonderful feature,s but it is not recommended for people with weak eyesight since the display has some issues especially in the case when the sun is at its best. Various users reported this problem and it has been specified by the company itself as well. There are different types of fish finders available online and the best thing would be that you get the right fish finder for the right price. As they are already very expensive, you cannot afford to buy them again and again. This is why we always suggest our customers have a look at our website before making a final purchase since our website always has the best products waiting for you. We also caution you regarding those products which you must be careful about. Let’s find out if the Venterior Portable Fish Finder Wireless Sonar Sensor Depth Color LCD Display falls in which category. Who doesn’t love having a wireless thing? Of course, we all want to have the least amount of wires in the 21st century. Having said that, this Venterior Portable Fish Finder comes with a wireless sonar sensor which users have said is great quality. Now, you don’t need to have the worry of carrying long and heavy cables. As soon as the transmitter is submerged into water, it will turn on. Make sure it’s dry when not in use otherwise it will detect the water and keep on running and eat more battery. Unlike many other fish finders, this one can remember the setting when you turn it off. The display matters a lot since it is going to be the most helpful thing in letting you know the exact position of the fish. This fish finder comes with a Color LCD display which shows water depth, Temperature, Power Indicator, Simulation Mode, Bottom Contour, Depth Range, Depth Scale, as well as the Fish Icon. It shows you the different types of fishes like the different sizes. To save the power, the finder will turn off when not in use for 5 minutes. Other than that, two small holes are present which allow you to easily tether the finder with fishing line or boat. Auto & Manual Range Selection and 0.6-45M (2-148ft) depth range coverage. Other than that, it works like a charm and gives the user with zero reasons not to be contended with it. The entire package includes a wireless remote sonar sensor, a handheld wireless receiving host, a copy of User’s Guide, charge cables for sonar sensor, and a neck strap as well. Get it from amazon.com right now.